A recording of a performance marking the release of Corrected Slogans: Reading and Writing Conceptualism, by actor Jim Fletcher with Lakpa Bhutia, Alex Delinois, Sam Frank, Jordan Lord, and Ariana Reines. 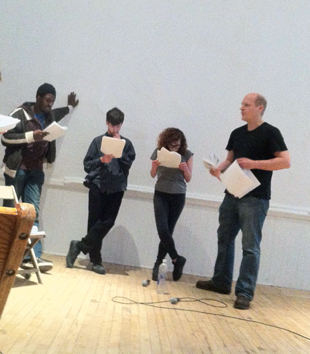 The performance, which took place at Artists Space Books & Talks on March 29, 2013, draws on various literary formats included in Corrected Slogans—transcripts, footnotes, stanzas, dialogue, indexes, and a lexicon—to interpret and amplify the book’s many textual registers, unraveling dialogues and vocalizing wordplay. Corrected Slogans is the culmination of the multipart project Corrected Slogans (A Publication in Four Acts), which was conceived as Triple Canopy’s contribution to “Postscript: Writing after Conceptual Art,” an exhibition organized by the Museum of Contemporary Art Denver. The book, which hinges on annotated transcripts of a series of public conversations, represents a collective effort to establish a new critical discourse around conceptual art and poetics.